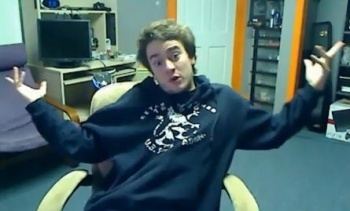 George Hotz, the hacker who posted the PS3 root key this year, tampered with evidence before running to South America. UPDATE: George Hotz, via his blog, explained that he is indeed in South America, but just on vacation. He planned the trip back in November, way before he was ever sued by Sony (or allegedly posted the PS3 root key) and I respect that he has decided to take some personal time while he still could. Hotz made sure to state that none of the funds he raised to defend himself were used to travel. "Factually, it's true I'm in South America," he said. "I mean, it is Spring break; hacking isn't my life. Rest assured that not a dime of legal defense money would ever go toward something like this." Hotz also hasn't abandoned the case. "I have been in contact with my lawyers almost every day; I would not let the case suffer. That said, I also won't let this ridiculous lawsuit run my life either." He didn't address the specific claims of tampering with evidence, but I'm sure that is probably best left to his lawyers. So to be clear, George Hotz did not "flee" the country, and he's still committed to fighting Sony in court. Thanks to Harshil Goel for the tip. Original post: The plot thickens. George Hotz aka GeoHot first came to internet prominence by "jailbreaking" the iPhone and PS3 and posting the software necessary to unlock the capabilities of each device without the restrictions set by Apple or Sony. This January, GeoHot might have crossed a line by publishing online the root key that allowed complete control over the PS3 hardware, posing huge security risks for Sony. Never a company to take such issues lightly, Sony has brought the full force of its legal team against Hotz. And even though GeoHot was able to raise enough legal funds to fight back, Sony today filed a motion saying that the hacker has not cooperated with court orders to hand over the hard drive of his PC and that he lied about having a PSN account. Sony claims that Hotz has now left his home in New Jersey and traveled to South America in order to escape further legal action. "After Magistrate Judge Spero ordered an inspection of Hotz's devices and ordered Hotz to appear at a deposition in California, SCEA learned that Hotz had deliberately removed integral components of his impounded hard drives prior to delivering them to a third party neutral and that Hotz is now in South America, an excuse for why he will not immediately provide the components of his hard drives as requested by the neutral," the motion read. In the understatement of the year, the opposition stated: "Hotz's attempts to dodge this Court's authority raise very serious questions." Beyond just running off to tropical locales, Sony has proof that Hotz created a PlayStation Network account and therefore agreed to the PSN User Agreement. "Hotz identified four PS3 Systems in his possession," the motion said. "He explained that he had purchased one of these consoles new in February 2010 and provided the serial number for that console. SCEA used that serial number to determine that on February 25, 2010, Hotz purchased the PS3 System at a Gamestop store just miles from his home. CEA's records show that the same PS3 System was used on March 10, 2010 to create a PSN account under the user name 'blickmanic.' The IP address associated with the registration is located in Glen Rock, New Jersey, where Hotz lives." Sony's opposes the motion made by Hotz's lawyers to dismiss the case "for lack of personal jurisdiction and improper venue." The judge has yet to rule on the motion, but I have to admit that it doesn't look very good for GeoHot.